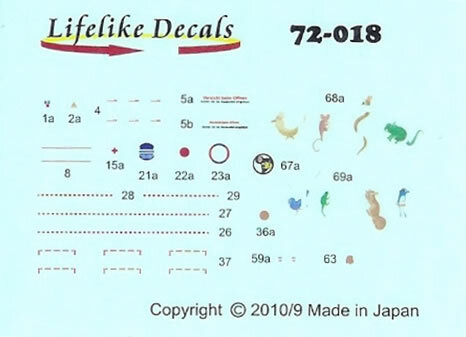 Available on-line from Lifelike Decals for ¥1000 and from Hannants for £7.49. No RLM or other paint call-outs, no additional aircraft information or dates etc. Excellent decal production quality, but instructions a bit lacking in background information and paint colour codes. 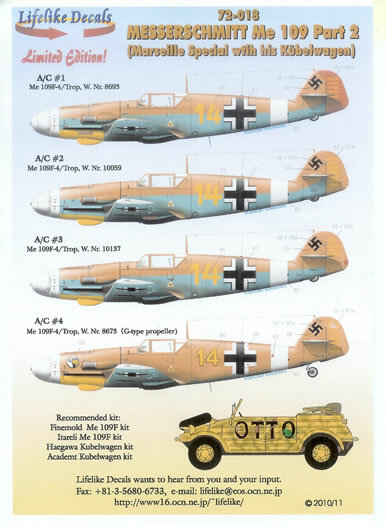 For me the Bf 109F is perhaps the best looking of the numerous versions of this famous aircraft, and its clean lines are only enhanced by the crisp and simple desert scheme as covered by the decals reviewed here. 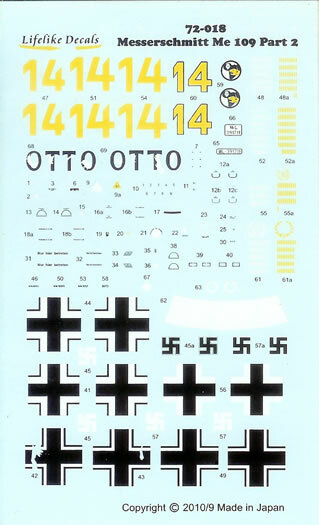 The set provides markings for perhaps the most famous desert ace of all, Hans Joachim Marseille. 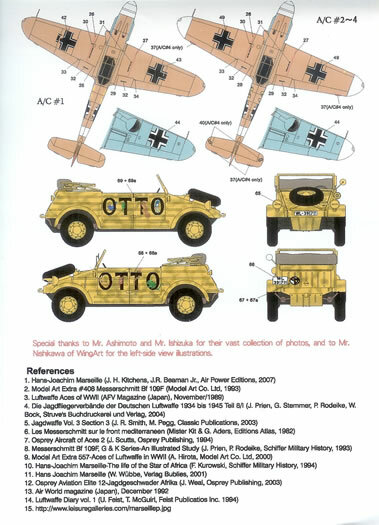 It features four of the aircraft he flew, and as a bonus provides decals for his Kubelwagen named “Otto”. Lifelike probably have a wining combination with perhaps the first or second most popular model aircraft subject, a top German ace, and a nice but simple to execute colour scheme. The Kubelwagen decals are a nice bonus for diorama builders. The decals come in the ubiquitous A5-sized zip-lock bag with a folded A4 page for instructions. These are very nicely printed in colour. However they lack any colour call-outs, and simply provide the aircraft version and works number. There are no narratives on service dates, location, or any other background information. The decals themselves look to be superbly printed and with good colour density. 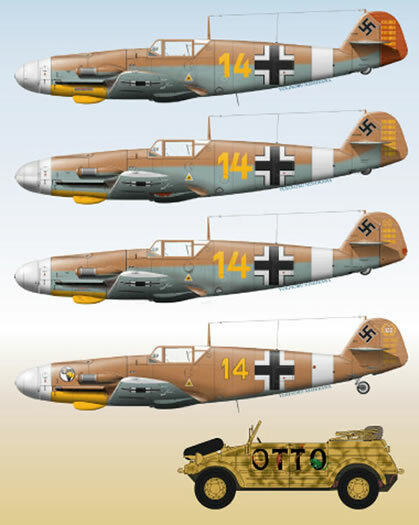 Sufficient national insignia for two complete aircraft are provided, however one set of upper wing crosses have ragged clear areas within their borders to represent where the black paint had worn away on the real aircraft. An additional small sheet provides stenciling for one airframe. These are superbly produced decals of an attractive and popular subject. Whilst most will know the correct RLM colours for the schemes selected, I feel that the instructions should still include RLM or other paint codes. A little more information on each aircraft’s background would also have been nice.